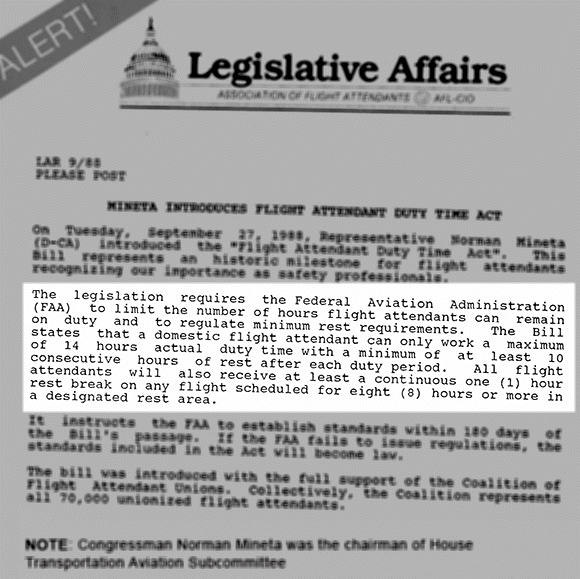 Jan 7, 2016 - In 1988, then Congressman Norman Mineta introduced the 'Flight Attendant Duty Time Act' during his tenure as chairman of House Transportation Aviation Subcommittee. The bill aimed to set Flight Attendant minimum rest time of at least 10 consecutive hours between duty periods. Mineta later served as Department of Transportation Secretary from 2001-2006 and science would confirm his suggested requirement of 10 hours minimum rest. It's been 28 years since Mineta introduced his bill and it's past time for 10 hours rest. The FAA Reauthorization must include 10 hours minimum rest for Flight Attendants. Sign the petition to Congress now.